That's a shame - it's a hell of a lot of phone otherwise. It is a shame when phone deals get posted here , if people run down gearbest or the phone based on Auntie Aida stories. I have a ulephone power for over a year,it is one of the best phones I have come across.. I would thoroughly recommend them. I prefer to buy phones via Aliexpress and pay the insurance, so if there was an issue they have a uk repair/replacement service. I cannot fault the ulephone power, it is only if you want a bigger screen go with something else. I bought a ulefone phone back in Feb 2014. Best phone ever, still working perfectly today and still takes better pictures than most phones around today. Sadly I have to retire it because it was not fast enough for some of today’s apps. Last year, I bought the Ulefone Power 1. After 6 months it developed a problem where the back camera pics were blurry. Banggood refunded me the full price plus the return postage. It did take awhile though. But that was the first Chinese phone I had (I have so far ordered 9 phones/tablets) from China with problems. Hence, I have no issues ordering again. The savings are worth the minimal risks. I have ordered so much stuff off gearbest and never had an issue, and with 10 day free tracked shipping to the UK there a lot faster than other similar sites. 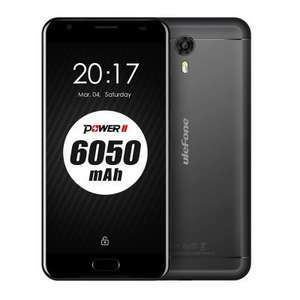 It is a shame when phone deals get posted here , if people run down … It is a shame when phone deals get posted here , if people run down gearbest or the phone based on Auntie Aida stories.I have a ulephone power for over a year,it is one of the best phones I have come across.. I would thoroughly recommend them. I prefer to buy phones via Aliexpress and pay the insurance, so if there was an issue they have a uk repair/replacement service.I cannot fault the ulephone power, it is only if you want a bigger screen go with something else. Strongly disagree with you. I bought a ulefone power last year from gearbest. Really nice phone, mediocre camera excepted. After 3 months the touch screen went. Options I was given were 40$ credit to my 'wallet', 25$ off a new one or return it tracked at a cost of £40+. Lesson learned. Gearbest are fine for cheap items but that's it. People need to be aware of the risk they take when they order relatively expensive electronics from gearbest and similar. Mine also used to need an occasional reboot before giving up the ghost. I suspect it may have been linked to the heat generated by the huge battery when on super quick fast charge. The device used to get very hot. Mind you, it was great going 2-3 days between charges. In the end i took a gamble and sent mine back to Gearbest by Royal Mail but not fully tracked (about £15). Gearbest denied ever receiving it. I have the older model of the Ulefone power and had no issues with it. Bought it through Gearbest. The thing has been fault less after 18 months and the battery life is incredible.